Our suggested India with Sujan luxury hotels tour offers an unconventional yet super-stylish journey through the highlights of Rajasthan. The experience begins upon your arrival in the Pink City of Jaipur, where the fabulous Sujan Rajmahal Palace is your base for drinking in the splendid forts and palaces of India’s most vibrant city. 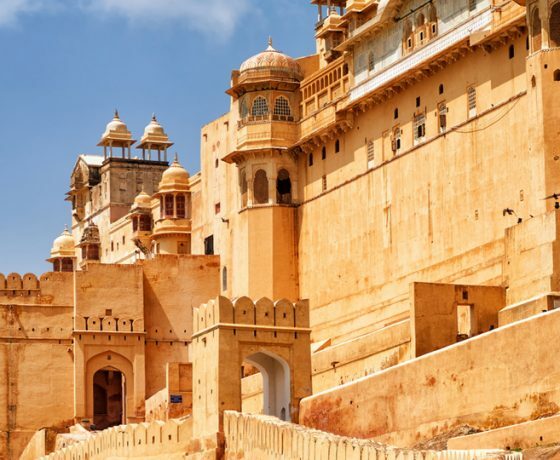 A short flight to the city of Jaisalmer’s next, where you’ll spend three glorious nights in a luxury tent at The Serai; think sunset camel rides, champagne on the dunes, and a privately guided tour of the thousand-year-old fort. 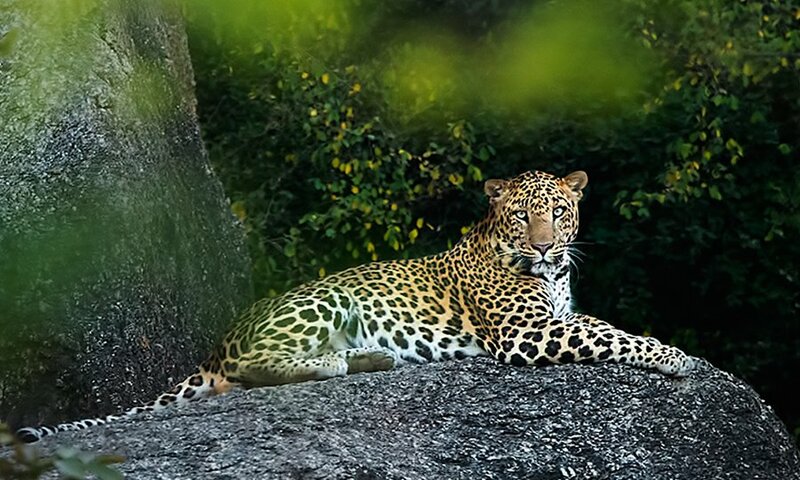 The journey concludes with a stay at the group’s newest addition, Sujan Jawai; a luxury camp amongst untouched wilderness where days are spent spotting leopards on safari, whilst your gorgeous tent, private butler and very own plunge pool await your return. India with Sujan luxury hotels is an ideal escape for those who’d enjoy a heady mix of history, architecture, culture, wildlife and stunning natural surroundings, whilst having the opportunity to relax amongst truly comfortable accommodations and switch off. We feel it’d be perfect for someone whose previously dipped their toes into India and would like to return for a more immersive experience, though it also makes for a fantastic family holiday (what child wouldn’t be excited by camping, leopard spotting, and camel riding?!). With all our tours being private and tailor-made, this is merely a suggestion and the itinerary can be tweaked or completely transformed to best suit your tastes. For example, a stop in Delhi at the start and/or end of the journey can certainly be added, as can a visit to the Taj Mahal in Agra. In a nutshell: 11 days, 3 Sujan luxury hotels, infinite memorable experiences. And, as a little thank you from Indian Excursions, we’ll treat you to a complimentary upgrade at a Sujan of your choice. Upon arriving in Jaipur, you’d be welcome by a member of our team and accompanied to the Sujan Rajmahal Palace, where he or she will assist you with checking in and arrange a time to begin sightseeing tomorrow. The remainder of the day is at leisure to relax, settle in, and enjoy your surroundings. Should you be arriving in India through Delhi, Mumbai or elsewhere, Indian Excursions would be delighted to assist with your arrangments in getting to Jaipur. 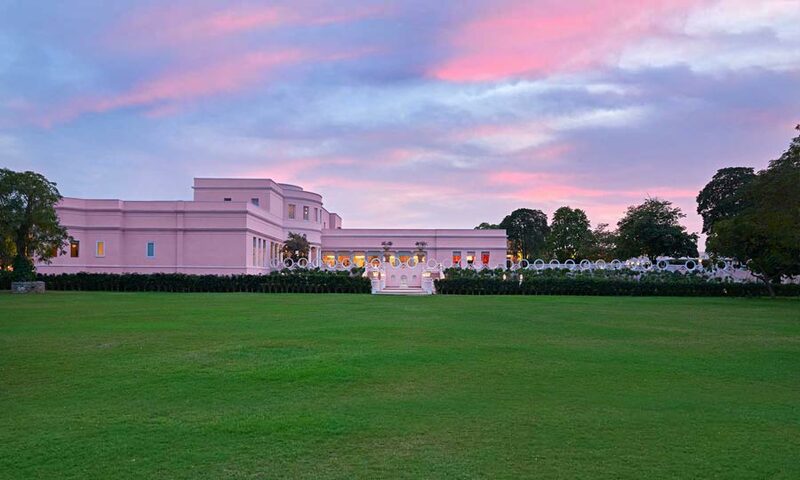 Sujan Rajmahal Palace is one of the most exciting hotel openings in India in recent years, though one would be wrong to call it new – dating back to 1729, it was formerly the royal residence of the Maharaja of Jaipur and boasts a colourful history. 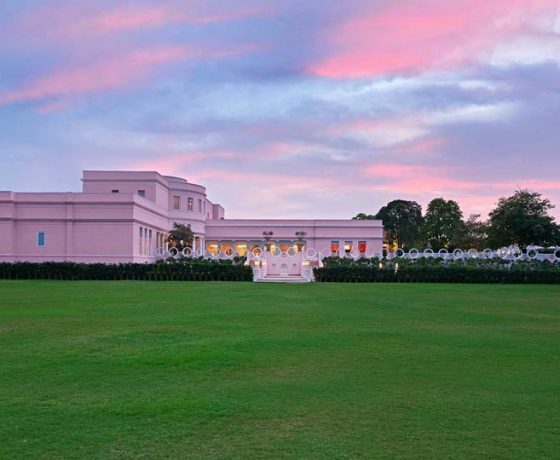 Now under the management of Sujan luxury hotels, the palace was recently renovated by leading Indian designer Adil Ahmad and is now bursting with bold colours, bespoke furniture, and 46 types of custom-made wallpaper adorning the walls. Each of the 14 rooms and suites is inspired by former guests; from Queen Elizabeth II to Lord Mountbatten and Jackie Kennedy. Exploring the old walled area of Jaipur today, your guide will introduce you to the City Palace (and it’s little-known private rooms), the Jantar Mantar observatory and the elegant Hawa Mahal. Continue on foot with a guided tour through the colourful bazaars, selling everything from local handicrafts and semi-precious jewellery to pots and spices. The morning is yours at leisure in Jaipur to relax, do a bit of shopping, or do your own thing. In the afternoon, visit the splendid 17th century Amber Fort before spending the evening with elephants at Dera Amer. Rise early this morning for an exhilarating hot air balloon ride over the Pink City – it’s an amazing way to soak up India from another perspective as you gently float through the skies. Later today, board a short flight to Jaisalmer (1 hr) where, upon landing, a representative of Indian Excursions would be waiting to greet you. From here, head to the arid outskirts of the desert city where you’ll be spending the next three nights, in a luxury tent at your second of three luxury Sujan hotels; The Serai. 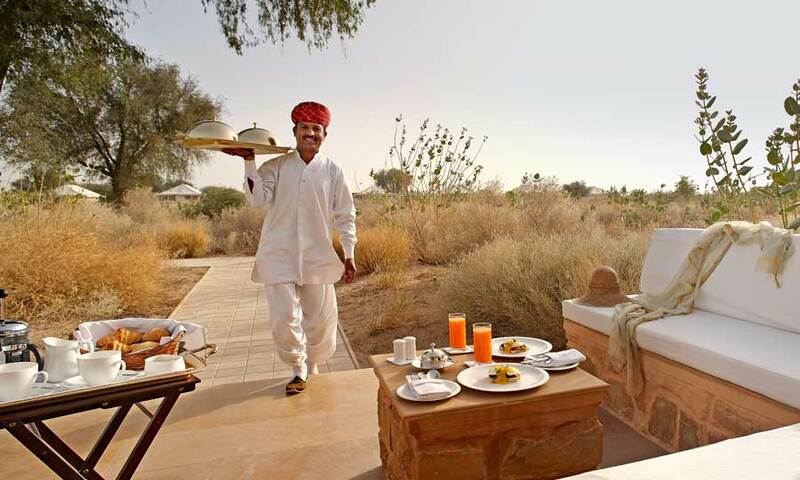 An oasis in the desert, Sujan The Serai sprawls across a hundred acres of private estate on the edge of the Thar. 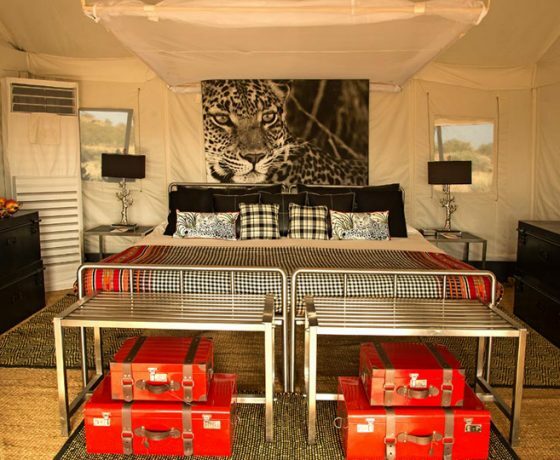 Inspired by the royal caravan sites of yesteryear, each of the stunning tents boast their own terrace, a sitting room with writing desk, air-conditioning and an en-suite bathroom. The Luxury Tented Suites boast their own private plunge pool – perfect for relaxing in with a G&T whilst you soak up the desert sky above. 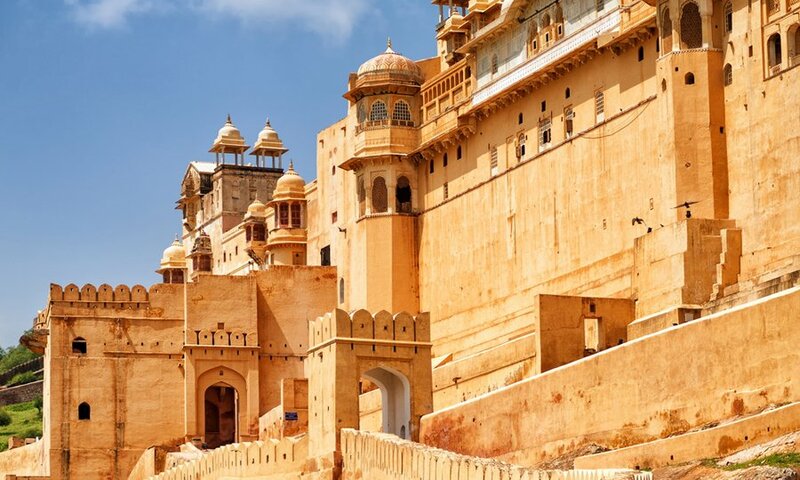 Head into the old medieval city of Jaisalmer today where you’ll be met by your guide for a tour of the fort, as well as the stunning temples, havelis (carved mansions) and narrow streets that lay within. Jaisalmer Fort is one of India’s last living forts – the walls enclose a bustling community of houses, shops and businesses. Return to the camp this evening where a private Jeep awaits you for a safari through the desert scrub, spotting indigenous wildlife and local shepherds with their herds. Disembarking your Jeep, a camel ride will transport you for the last leg of your journey over to the private dunes, where a butler will be waiting with champagne and canapes whilst you take in the famous desert sunset. 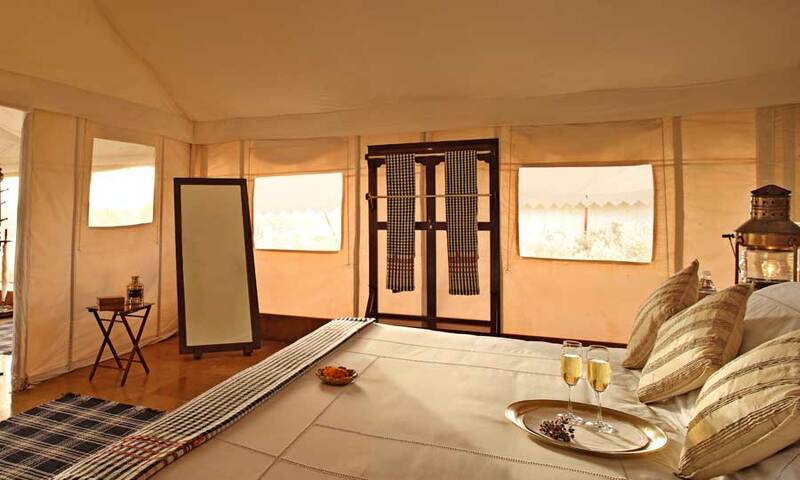 The day is yours at leisure in Jaisalmer to relax and enjoy your surroundings at the camp. We’d recommend embarking on one of The Serai’s activities, or indulging in a treatment at the spa. The spa is highly acclaimed, with locally-sourced organic and ayurvedic products. A long but scenic drive today will take you to unexplored Jawai Bandh (6 hrs). 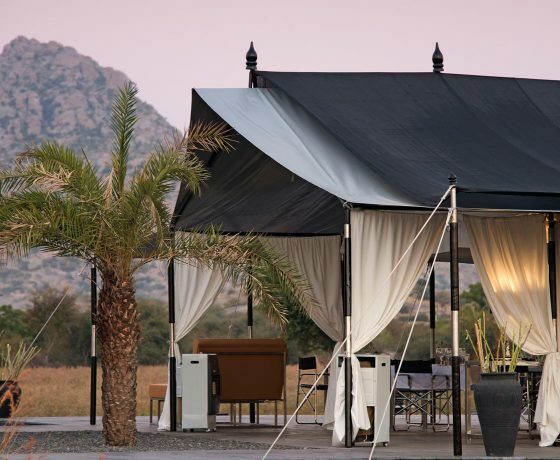 As you’d expect from a Sujan property, Jawai is deliciously sophisticated and glamorous, whilst remaining at home in its surroundings and actively working towards conservation of the local area. 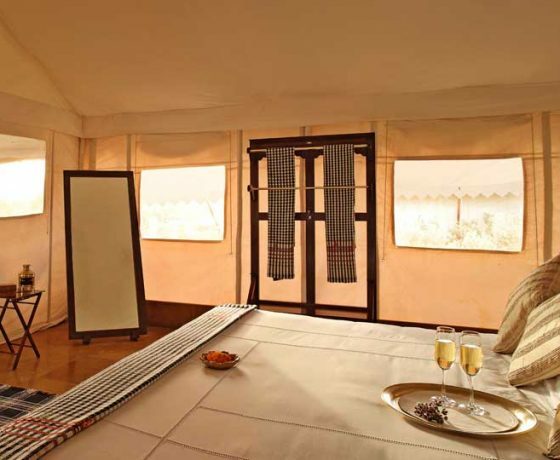 Each of the ten luxury tents is intimate, spacious and tastefully adorned in a unique fusion of safari-meets-Rajasthan. 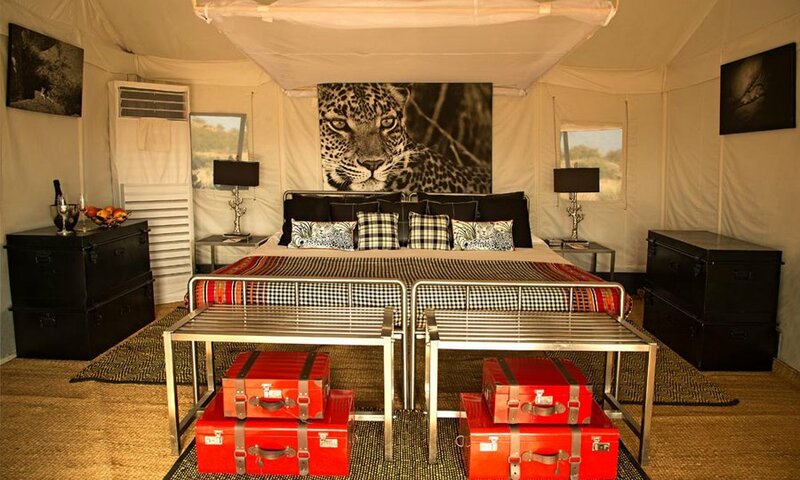 Billowing canvas, sepia leopard portraits and black leather furnishings are embellished with locally sourced crafts and en-suite rain-shower bathrooms. 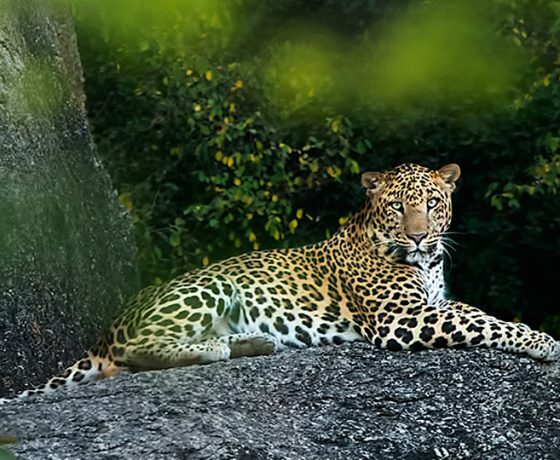 Over the next two days, embark on morning and afternoon safaris through the surrounding wilderness, on the trail of leopard. Between-hand, if you’re feeling active we’d recommend taking a walk by the lake where over 170 species of migratory birds can be spotted, as well as an insight into the local fishing community. Alternately, jump one on of the camp’s bicycles for a guided expedition through the beautiful landscapes. Today, we’d recommend an excursion to Kumbalgarh Fort (about an hour’s drive) and the nearby, stunningly-carved Jain temples. Kumbalgarh Fort is affectionately known as the ‘Great Wall of India’, with 36kms of walls snaking around 365 temples, palaces, gardens and no less than 700 cannon bunkers! Standing 1,100 metres (3600 ft) up amongst the Aravalli hills, the views here are absolutely breathtaking. In Ranakpur lies one of the finest examples of temple architecture in India and a whopping 1,444 pillars boast unique carvings. This morning you’ll be chauffeured to the nearest airport – Udaipur (3 hrs) – to board your onward flight. Should your schedule allow, we’d recommend spending a night or two here in Udaipur – dotted with fairy-tale like palaces and shimmering lakes, Udaipur is incredibly romantic and especially so when staying at the dreamy Taj Lake Palace, a 250-year-old marble palace appearing to float in the middle of Lake Pichola. On the other hand, if your journey is to come to an end here, an international flight that departs in the evening or later will afford the time to fly back to Delhi or Mumbai beforehand. 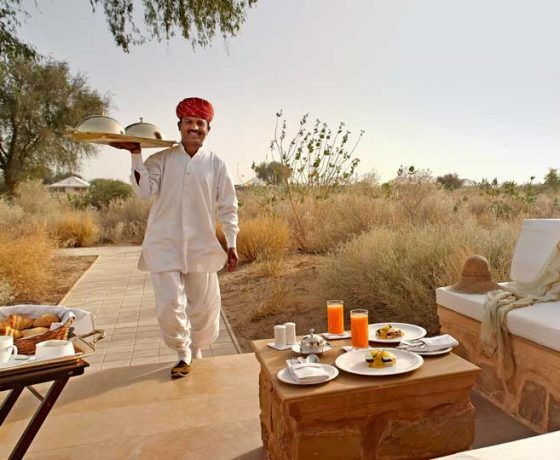 The journey is inclusive of accommodation in Sujan luxury hotels throughout, daily breakfast, dinners in Jaisalmer and all your meals at Jawai; a private car with driver throughout, experienced guides, entrance tickets and excursions. In other words, we offer a seamless and hassle-free experience where the only thing you need to worry about is soaking up the sights and enjoying your fabulous hotels! This indicative cost is based on a couple travelling between October 2018 and March 2019, sharing a double or twin room. 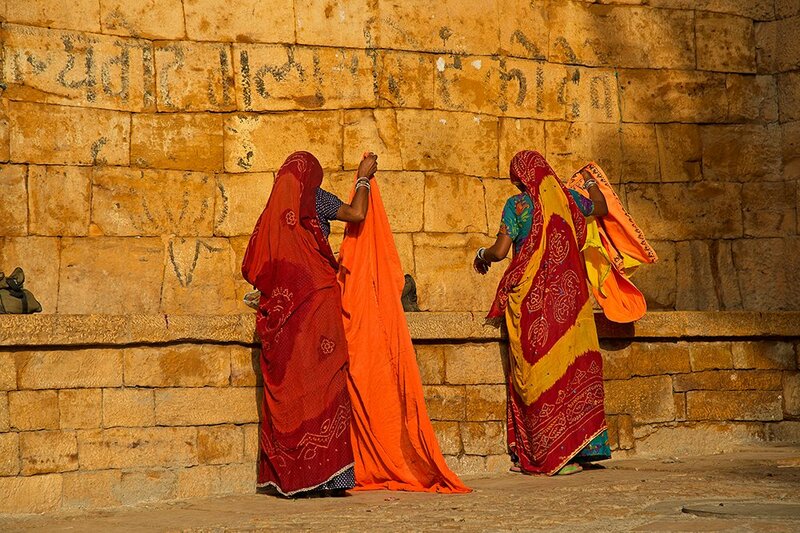 Our India with Sujan luxury hotels itinerary is merely a starting point to share a flavour of the possibilities. Whilst this is a route much-loved by our guests, every detail is flexible and would be designed around you. 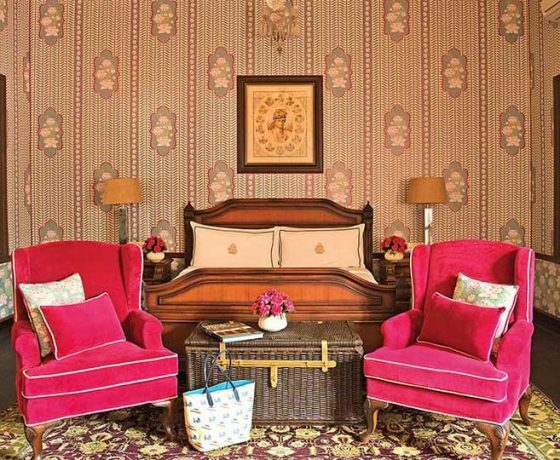 For example, if that long drive from Jaisalmer to Jawai turns you off, a night or two in the Blue City of Jodhpur en-route is an ideal way to connect the dots (we’d recommend staying at the Taj Umaid Bhawan Palace. Fit for royalty, the Maharaja himself still lives here in a private wing!). Similarly, a stay in Agra can be slotted in before Jaipur if you’d like to visit the Taj Mahal. You may also find out Top 10 Luxury Camps in India inspiring. All our tours are private and tailor-made to complement your tastes and interests – the itinerary described above can be tweaked or completely transformed until we’ve created your ideal holiday.